Commercial roofs could be required for a number of reasons, specifically if the existing roof is in need of repair or it will be attached to a new build. There are many factors that will contribute to the design and planning of a new commercial roof and the cost will all depend on the size and style you opt for. This type of roofing has become exceedingly popular and is made from a durable material with high temperature tolerance. 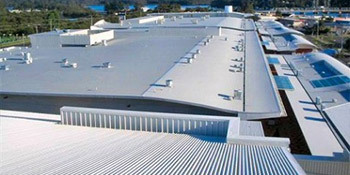 The material is a favourite for commercial roofs as it’s resistant to ultraviolet and chemical exposure. The roofing will last for more than 20 years, with a great resistance for fire, punctures and high wind loads. The durability and versatility of EPDM roofing makes it a popular material in the commercial roofing world. These types of roof material have the advantage of being easier to install, maintain and repair too, adding to their popularity. There’s no denying that energy prices are on the rise and one way to combat this is with renewable energy products such as solar panels. These are installed onto the existing rooftop or integrated with glass, and harness the sun’s natural rays to generate free electricity. Out of all the possible materials and type of roofing you can opt for, green roofing has seen the greatest surge in popularity. These types of roofs are often flat, with vegetation and soil over a waterproofing membrane. They not only absorb heat, but also improve the property’s insulation. Green roofs can extend a rooftop’s lifetime by two to three years as well. No matter the size or type of roof you need to have replaced or built, there are plenty of options for you to consider, giving you the ultimate choice in material and style. For up to four FREE commercial roofing quotes from local, vetted and reputable companies, simply complete our quick quote form. Project: Internal leak and water damage which we suspect is coming from a blocked gully or loose tiles. The below information demonstrates the energy performance of properties in Uk. Energy ratings vary from A to G, with A being the most energy efficient and G being the least efficient. The Energy Performance Certificate (EPC) rating factors heavily when you want to sell your home, as potential buyers will see how much they're most likely to be paying for their heating bills. House improvements including insulation help you to substantially improve a home's EPC rating. The information underneath reveals the diverse types of houses in Uk. The most common homes throughout the United Kingdom are detached and semi-detached properties. Other types of homes consist of terraced houses, flats, converted flats and bungalows. The pie chart beneath reveals the portion of houses in Uk that are central heated and non-central heated. Central heating figures in the majority of UK properties, which includes those on the gas grid and properties heated by oil and electric. The data underneath reveals the spread of properties heated by various fuels. Throughout the UK the most common hands down are gas heated properties, followed by electricity and then oil. Biomass central heating boilers are also rising in popularity, heated by environmentally friendly products such as wood pellets or agricultural waste.|Homes in Britain are heated by a variety of fuels, which include gas, electricity, oil, solid fuel and LPG boilers. Each fuel has a varying cost associated with it which means you can find yourself with less costly energy bills by changing how your property is heated. Even solar thermal panels are being regarded as by many in order to lower heating bills for the years to come.